News - The S&P 500 tanked twice this year by some 10%. Neither nice nor historically unusual. The S&P 500 tanked twice this year by some 10%. Neither nice nor historically unusual. Dropping twice by some 10%, as the index has this year, might seem more exceptional. But it is not that uncommon, too, when looking back in history: at least two declines by 10% or more within one year have occurred seven times since 1990. So far, 2018 has proved to be disappointing for equity investments in many respects. There are still a few weeks left, but at the moment the S&P 500 is trading around 3.7% below the forecast we published for the end of 2018 about one year ago. Other markets have done even worse. After unusually quiet markets in 2017, we expected volatility to rise again. This seems like an easy call in retrospect, but one shouldn’t forget that the same, "obvious" call would have proved wrong in the past couple of years. 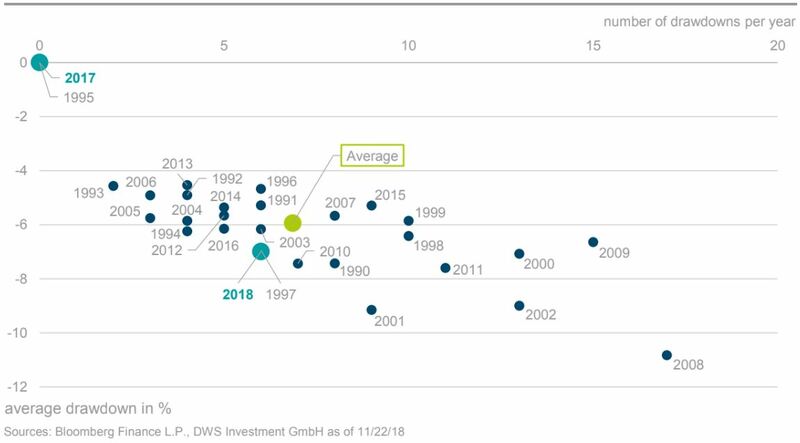 In our "Chart of the Week", we compare the number of S&P 500 declines of at least 3% with the average magnitude of the decline in each calendar year. This shows that 2018 almost exactly matches history: in 2018, we saw six times a decline by more than 3% (average fall: 7%). Since 1990, declines of more than 3% occurred almost seven times a year (average fall: 5.9%). So from an average-volatility perspective, 2018 is just a normal stock-market year. Looking at the top left corner, 2017 was the big exception, when the S&P 500 did not drop by 3% or more even once.